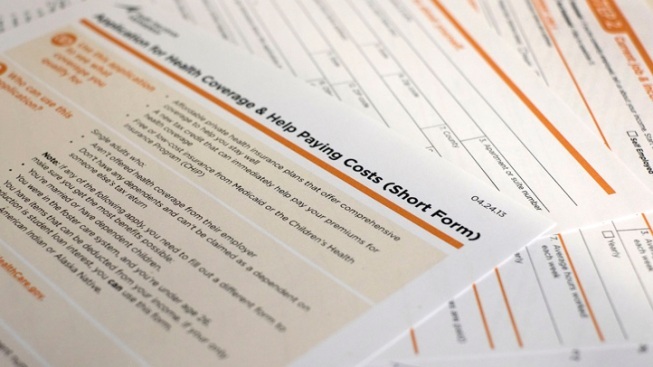 A new report to be released Tuesday by the Department of Health and Human Services reveals that millions of Americans without health insurance will likely pay less than $100 a month. A new report to be released Tuesday by the Department of Health and Human Services reveals that millions of Americans without health insurance will likely pay less than $100 a month once they are able to sign up for government subsidized health insurance under the Affordable Care Act. About 6.4 million Americans eligible to buy health insurance through the new health exchanges will pay $100 or less a month for "silver" insurance plans because of tax subsidies. About 41.3 million people don't have insurance now, according to the HHS. In the 25 states that have chosen to expand Medicaid coverage, 12.4 million uninsured eligible Americans will pay less than $100 a month, the report found. They will either pay nothing or a small premium to take part in Medicaid. If the remaining states decided to expand Medicaid to those who earn below 138 percent of the poverty level, about a quarter of the 41.3 million people without health insurance would qualify for Medicaid, tax subsidies or the Children's Health Insurance Program. The theme-park owner will reduce hours for thousands of part-time and seasonal workers to 28 hours a week, down from the previous limit of 32 hours a week. The workers will now be classified as part-time under the Affordable Care Act. Under the ACA, large employers are required to offer comprehensive and affordable health insurance to all employees who work at least 30 hours a week.